Instagram can be a pretty strange place. One minute, youâ€™re looking at your momâ€™s grainy photo of her cat. And the next minute youâ€™re scrolling by reality TV stars trying to sell vitamin gummy bears. Itâ€™s not just me though. Sooooo many business owners from all kinds of different industries are investing in Instagram. And itâ€™s working. Sara Christensen of Kickass Masterminds â€” one of the industryâ€™s top mastermind groups â€” is one of those business owners. Like me, sheâ€™s seen how powerful and profitable Instagram can be for biz. 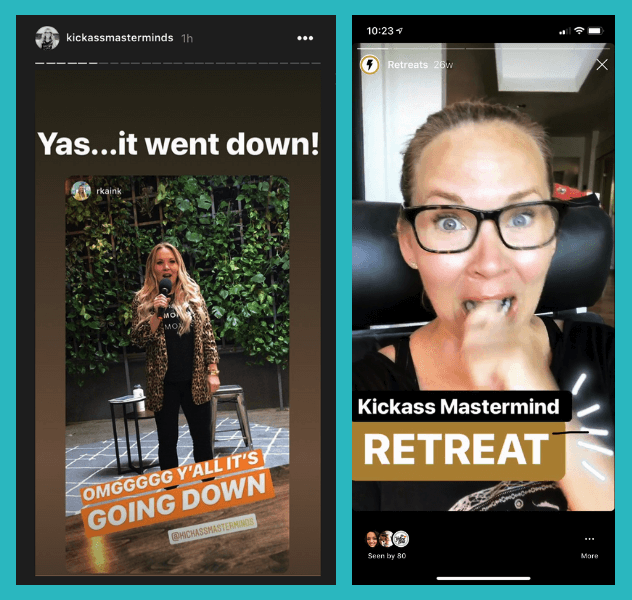 After doing an Instagram strategy session with me in January 2018, Sara made Kickass Mastermindâ€™s Instagram account one of her main focuses. She consistently put my strategies into action and grew her following to about 2,000 followers. Two thousand doesnâ€™t sound that impressive, right? Except that she focused on quality over quantity. It paid off in a big way. The quality of her followers mattered more to Sara because Kickass Masterminds is a business thatâ€™s all about people. The sole focus of Kickass: producing high-value mastermind groups of smart, accomplished people that help elevate participating entrepreneurs to get to the next level of their biz. Kickass creates these masterminds for established, full-time entrepreneurs, as well as hosts masterminds for other brands and businesses. In the world of masterminds, Kickass is the best in the biz. Near the end of 2018, Kickass Masterminds SOLD OUT its exclusive three-day Mastermind Live event. This event was capped at 40-ish people and tickets were an investment of up to $2,000. Almost a year to the day of our first Instagram strategy session call, we chatted again so she could fill me in on her awesome success. If you would prefer to watch Sara share her story in video format and hear how this all went down straight from her, scroll to the bottom of this post. 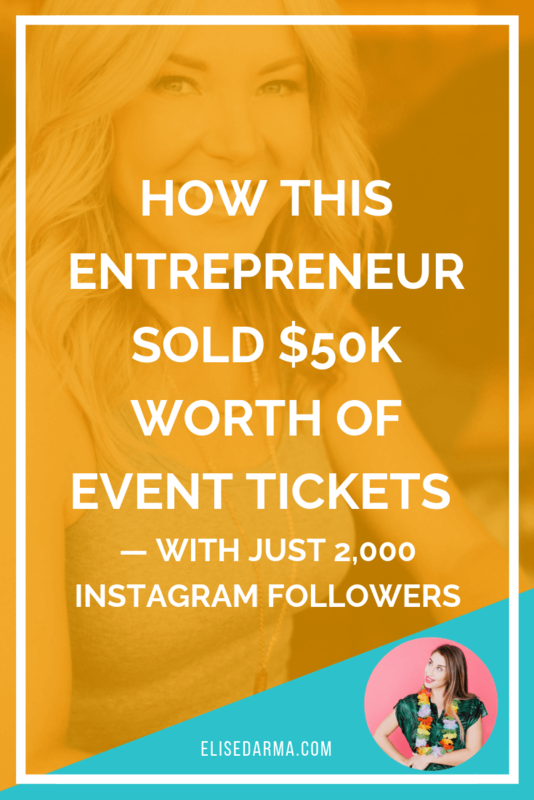 Kickass Masterminds had about 500 Instagram followers when Sara reached out to me in early 2018, wanting to sharpen her Instagram business marketing skills. Sara didnâ€™t want her business Instagram page to simply be a passive presence. She wanted to actively use the platform to make things happen. After our Instagram strategy session, she went to work in three particular areas. â€œFor us, it was really important to be able to have an Instagram strategy that allowed us to establish ourselves as the authority on masterminds, for whatever type of ideal client we were dealing with. Saraâ€™s business is all about those real-life connections. She wants her followers to join her offline, in face-to-face mastermind groups. To make this happen, Sara embraced Instagram Stories. Theyâ€™ve become the *secret sauce* for Kickass Masterminds. Sara cultivated her own Story tactics, and theyâ€™re totally working. Sara tries to always be informative and entertaining. She uses the GIF feature often to add some laugh-inducing details to her content. Sara says only some of her Instagram Story content is planned strategically. Itâ€™s not like sheâ€™s using Canva to create templates for every Story. *Since the interview, IG has updated and made this part of the platform! As of January 2019, Kickass Masterminds has 2,200 followers on Instagram. Thatâ€™s about a 340% increase from last January. Thatâ€™s definitely good growth, but still not the *huge* kinda number that so many Instagram marketers get way too hung up on. Saraâ€™s happy with her follower count, though. Everyone says social media marketing is about relationships but Sara is someone who walks the walk. This is a concerted effort on her part, but she does it in a way thatâ€™s totally natural and authentic. Using Instagram, Sara has online conversations just like the ones she would have in the offline world â€” asking lots of questions, being encouraging, and cheering people on. Iâ€™m not kidding when I say she cheers people on. She actually promotes her followers and customers in her Instagram Stories, featuring them when theyâ€™re doing awesome things like launching a product or releasing a book. Here are some examples of Sara featuring OTHERS in her IG Stories. By focusing on engagement and not just numbers, Kickass Masterminds has managed to establish a following thatâ€™s active, interested and much more likely to actually become paying customers. When it came time to promote and sell spots for Mastermind Live, Sara turned to Instagram. Itâ€™s not like she was trying to sell a small purchase, like a $10 eBook or a $40 shirt. Mastermind Live is an intimate and exclusive event. The investment ranged from $950 to $1,950 and attendees had to cover their own accommodations and airfare. But all 40 event spots disappeared in no time. And a lot of them went to people whose first contact with Sara happened on Instagram. To get all 40 spots sold quickly, Sara used a few pretty genius strategies. Firstly, she made the event invite-only. This was to make sure that the guest list was a well-curated group of people who would get the most possible value out of Mastermind Live. Secondly, she created a personalized video invitation for every single invitee. These videos lived on a personalized landing page that included all the details for the event. Brillllll-iant. For Sara, these super personal touches were just a way of being consistent in her relationships with followers. â€œWe were consistent through that whole entire relationship. From the first contact we had with someone on Instagram, all the way through all those meaningful connections, celebrations, acknowledgements, all the way through to sending that invitation. But her event efforts didnâ€™t stop there. Oh, they most certainly did not. Sara went ahead and made a separate, private Instagram account just for the people attending Mastermind Live. It was meant to be an experiment, an alternative to using Facebook Groups for more intimate engagement. Because only the account owner can post content, the communication is sometimes one-way, which Sara says can be challenging. But she points out that people are connecting with each other in the comments, which is a big win for Kickass Masterminds, since their followers are generally way more engaged on Instagram than on Facebook. Itâ€™s a cool idea and a really unique way that Sara has taken Instagram strategies and adapted them to work for her business. And once youâ€™ve done that, you have to â€œcheck yourself before you wreck yourself as you are actually implementing your strategy and moving forward with your tactics,â€� Sara says. Then do like Sara did and go back to step one: the strategy. Show Me The Strategy! Instagram Growth Package is the secret weapon for busy business owners who are ready to take their Instagram efforts to the big leagues. One Instagram Strategy Guide that includes everything you need to know and follow in order to grow your Instagram account effectively. Show Me The Strategy! Instagram Growth Package is everything you need to take your businessâ€™s Instagram account from passive to powerful.